In his study of Constructivism, Barrett Watten examines the place occupied by the experimental imperative of radical literature and art within the broader context of a cultural poetics. From this study, the avant-garde emerges as a vitally necessary element in the exchange between social forces and the aesthetic activity. Watten discovers this vitality in a negativity that constitutes the aesthetics of the material text. 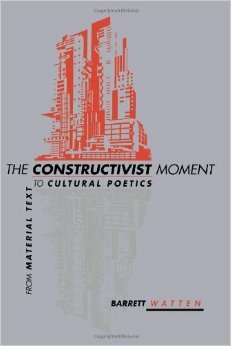 Through this negativity, Constructivism not only finds a place for its productions but at the same time offers, more generally, an incisive analysis of how the avant-garde constitutes itself as an experience of language at its limit. While remaining astutely aware of the important differences to which negativity has been submitted by Hegel, Heidegger, and Zizek, to name a few, Watten elaborates a theory of art that directly relates its openness to the work of the negative. This theorization of the avant-garde as art speaks importantly to the current critical situation in which theory, cultural study, and materialistic poetics are unavoidably engaged with one another.